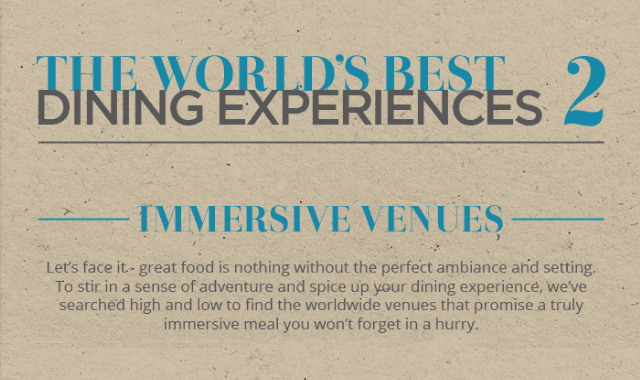 The World's Best Dining Experiences: Immersive Venues #Infographic ~ Visualistan '+g+"
As much as fine dining can really make for an occasion to remember, nothing makes a meal out special and unforgettable quite like the atmosphere of the venue itself. As the quality of haute cuisine has increased vastly and markedly in the last few years, so has the consumer demand for more and more outstanding and unusual and immersive venues in which to eat it. From multi sensory experiences to the most jaw dropping, mesmerising natural vistas, incredible themed restaurants to those where the food is the experience in itself, these are the venues around the world where dining out is so much more than just that. In this brand new infographic, online restaurant booking company Bookatable have searched far and wide to collect together the most unbelievably incredible, staggeringly unusual and just plain out of this world immersive dining venues on earth, to spice up your average meal and leave the best of tastes in your mouth every time. From six different continents and multiple different countries, here are the immersive venues that will get your heart racing, your creative juices flowing and your tastebuds tickling - you'll be cancelling all plans and booking up tables like it's nobody's business.